Feeding raw is nothing new in the world and also by us is not. Since I remember, tha dogs were fed raw, also by my grandmother. So its normal for us to feed this way too, is nothing like "its in, lets feed this way". Its a kind of dog food, we prefer. 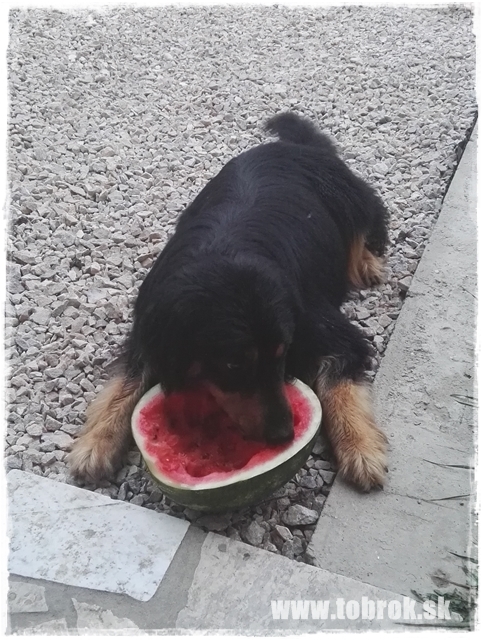 Since first days, when the puppies can, we feed besides mothe milk also from 3-3,5weeks high quality beef, deer, ground meat, after few days chicken skeletons, wings, necks,... We offer many kinds of fruits, veggies, supplies in this age not at all. We do not use puppy starter food prepared nor kibble. What the puppies left the mom eats. Everything is fresh. Also the new owners feed raw, I would say by 95% of puppies from us, feed the owners raw. Our juniores and adults, but also the seniors are few raw too, as supplies are used veggies, fruits, less oat flakes, rice or pasta. I try to avoid feeding with supplies in bigger mass. We do not feed that much with them. Hovawart, however, needs a bit more of them as the wolfdogs. I buy only high quality meat, for huma n use! I do not buy by companies, that sale food for dogs, even when its a good one. I buy meat from private farms, that have meat veterinary controled and for human use. I do not buy ground meat, i do it by my self at home, so I can see, what is inside. I prefer, however, give the dogs bigger pieces of meat. We freeze the meat, but the veggies or fruits never, we give allways fresh, we have own garden, chickens, nuts tree, plums, berries,... I prefer our local kinds of fruit and veggies, do not use so much exotic ones. Also season fruit and veggies. We give also milk products, but only tha acidic ones - chees, cottage cheese,... And sure oils - olive, fish, coconut,... From preparates Roboran for fur by change, for female imunity by heat and mating Imunoglucan. We have a separate room for the dogs stuff - grooming room and also a place to store the food, since we have a bit more dogs and other animals. Everything is in status - undrer construction, so photos later, when we have finished it. 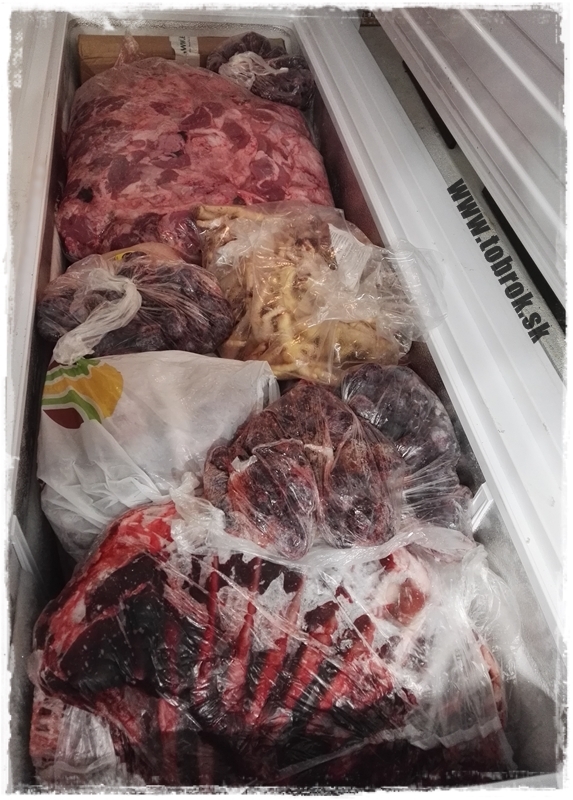 We have a separate freezer for the dogs meat and food, 350liters big. 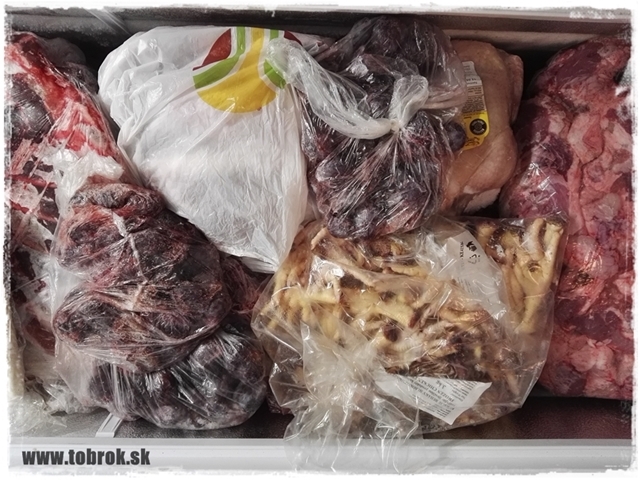 I have everything by hand, so preparation of dog food is fun and I like it :) We do not have from everything at home an amount, bu i have 4 kinds of meat everytime - a basic - chicken, beef, pork and wild - from all 10kg +-, meat bones also +- 10kg, inneries 5kg and I add fish and the like, if there is an action for it. I buy fresh fruits and veggies with our food. Everything by season. 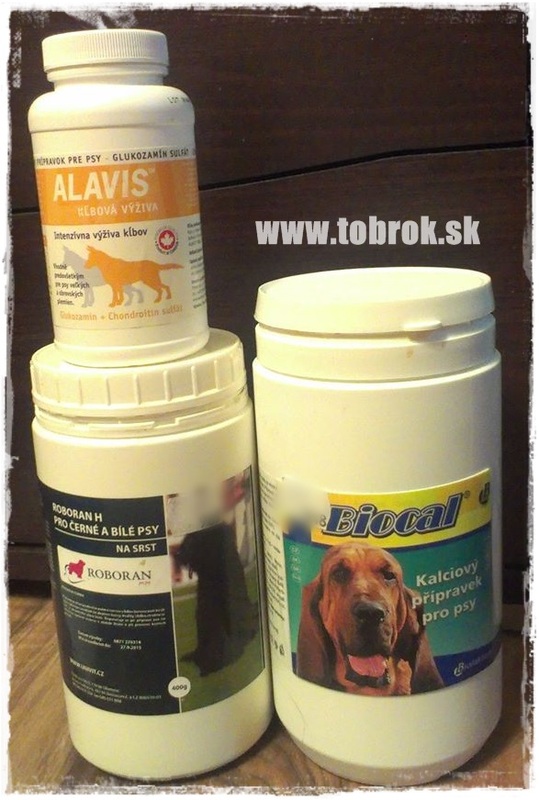 Preparates like Roboran and Imunoglukan or deworming tabletes we have from a special vet-store in Nitra. Everyone is learning, some supplies are now easy to have, not like in past, so also the feeding changed a bit by us with time. We have now better sources of meat and the like. At the very end of this page, you can find the examples of our dog bowls, the oldest at the end, the new at beginning. With time, I add more photos. Every day, dogs receive whole chunks, whether chicken skeletons, whole chickens, turkey, beef, ribs, also the pig heads or the limbs (deer/mouflon). One of the meals is always the combination of meat + bone that we give in the whole to make the dogs play, use their teeth and eat. Bones, often wild, deer or mouflon, are also a permanent feature. Always wrapped with meat. We give limbs, ribs, spines. Also excellent are pork bones, but with too little meat, given only with the muscles, otherwise there is a risk of constipation... Chicken foots are suitable as a source of calcium or as a crunchy reward. ... and as an alternative pig skin. Either in whole or sliced into smaller pieces. They are like chewing gum, so the dog will not immediately eat them. They are fatty, I also use them to make dogs have fats. Alternatively, you can cook on a huspenin that is excellent on the joints. Another alternative to classic bones are chicken heads. 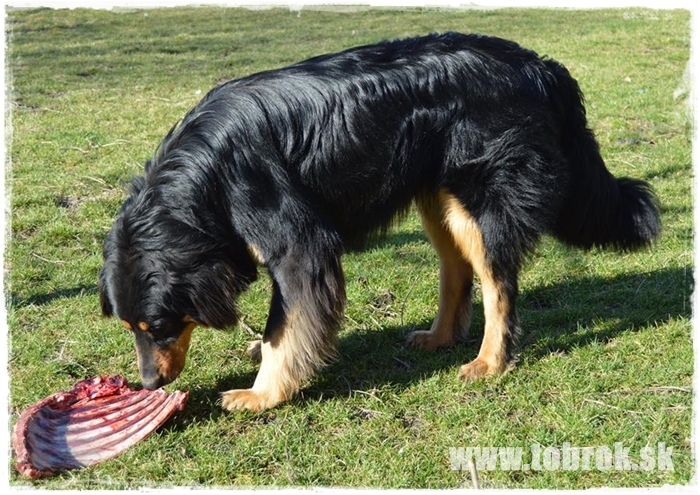 The basic kinds or meat, that we use - high quality beef, mostly for dogs in work, or pupps. 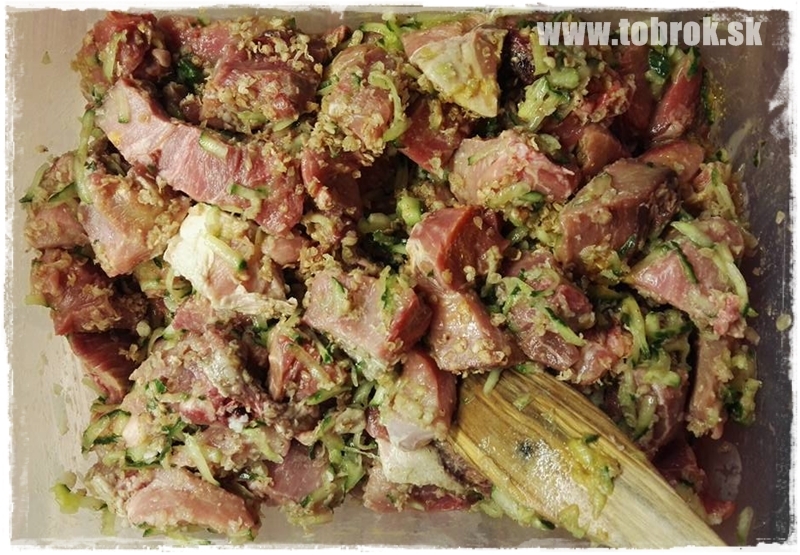 Pork for winter and dogs, that need gain weight. Wild deer, great choice if we want an alternative for beef. Chicken mear, or turkey. Universal meat for every age and great to keep the dogs fit. We buy chicken skeletons, with wings, guts, neck,... great are chicken, duck or turkey. Guts, the most used by us are liver and hearts (although they count as muscle). I give fish as tuna in own juice or oil, salomon, carp and the like. 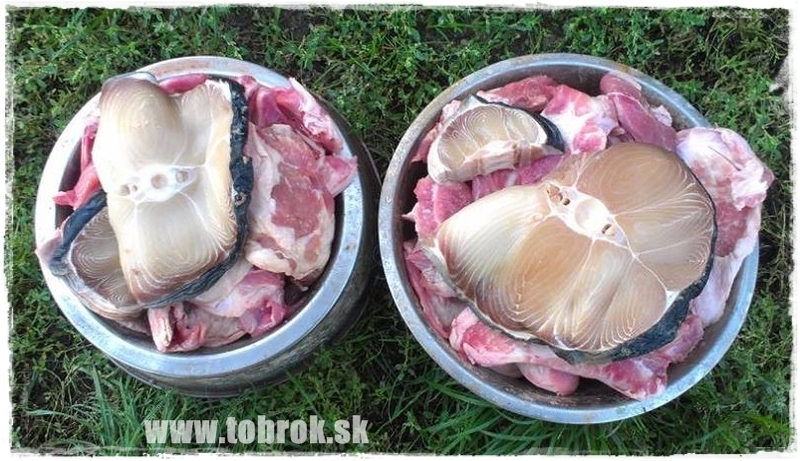 In Christmass time, you can have fish heads for free here... And if someone has no space for shark steak, like my friend, we give it to the dogs :) On photo with pork bones. I feed also with bit exotic meat, not only the "classical" ones. Sometimes, we have the option to feed ostrich, horse,... but not so often, so the photos will be add later. We also feed dairy products, but only those that are acidic. So cottage cheese, curd, acid milk or white yoghurt. Dairy products are mainly mixed with fruit or vegetables. We create some "salads" where yogurt or acid milk is as dressing. An alternative is sweet dairy, fruit and honey. Others, "greens" and other healthy "things"
The principle by us is, that vegetables and fruits are always fresh, not cooked or frozen! (The exception is broccoli, which I cook). 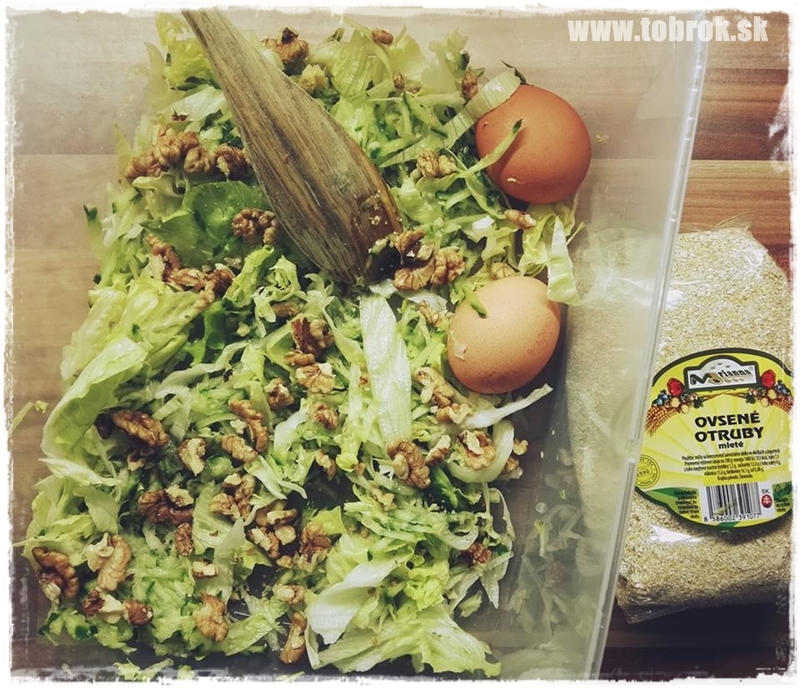 Preparation of the "green" base - cucumber, ice salad, walnuts from our tree, raw egg from our hens - later broken and mixed with the rest, cooked bran, than add chicken and ground beef to it. We use germinated seeds (mungo, lentils, ...), which we prepare at home, or buy ready-made BIO, gently chop them and add to the diet. We also use walnuts (minced, chopped or whole). Excellent are flax seeds (blended directly before serving), sunflower or pumpkin seeds, chia, poppy or coconut. From fruit we use apples, pears, plums, cranberries, blueberries, currants, melon. Yeast as a source of vitamins B group. Dried or fresh chopped dog roses are really rich in vitamins. Curcuma as a natural antibiotic, helps with digestive problems, full of vitamins and minerals. Honey, we use not so often, but is good source of vitmains too. If we give pure muscle, we add crushed egg shells. We have eggs from our hens. I dry them on newspapers above the radiator. Then I put it in a micro-pocket bag and crash it to smaller pieces. Someone also puts them in an electric grinder. I give the egg whole, raw. If I want to change a bit, i cook it. During the summer and in season, we prepare our own herb mixture, which we serve dry or fresh. We can find everything in our garden or by walk. Contains leaves of nettle, flowers of chamomile, hibiscus, sage, dog rose, leafy leaves and flowers and a few others. Preparates and special supplements are added less, but eg. for hovawart regularly the Roboran for coat. Calcium in powder we serve if we do not have egg shells and do not give bones as an attachment. The joints cure is added to puppies food in age of 5 months and over. In the period before mating, we add Imunoglucan and Folic Acid before the planned mating. Dairy food - oat flakes, white joghurt, chees, chopped apple, plum, pear, nuts, coconut, a bit honey and chia. If we serve meat without bones, we use either calcium powder or crushed eggs shell. 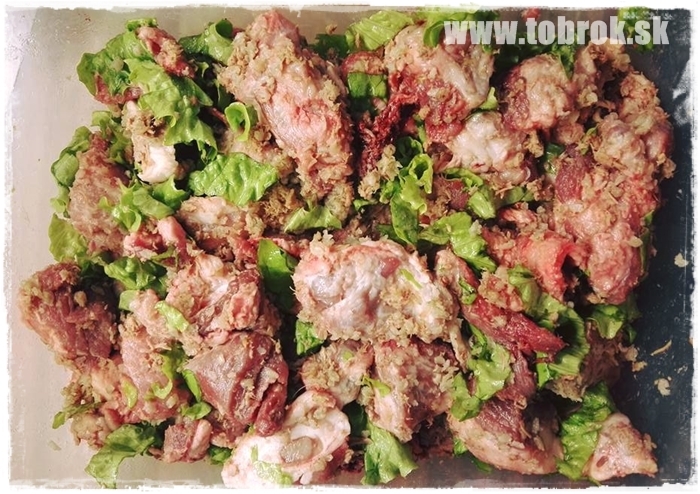 On the picture wild deer, ice salad, rice, oil, egg shells and Roboran - preparate for shedding coat. Fig. 2 Deer meat, ice salad, an egg from our home chickens and walnuts. Fig. 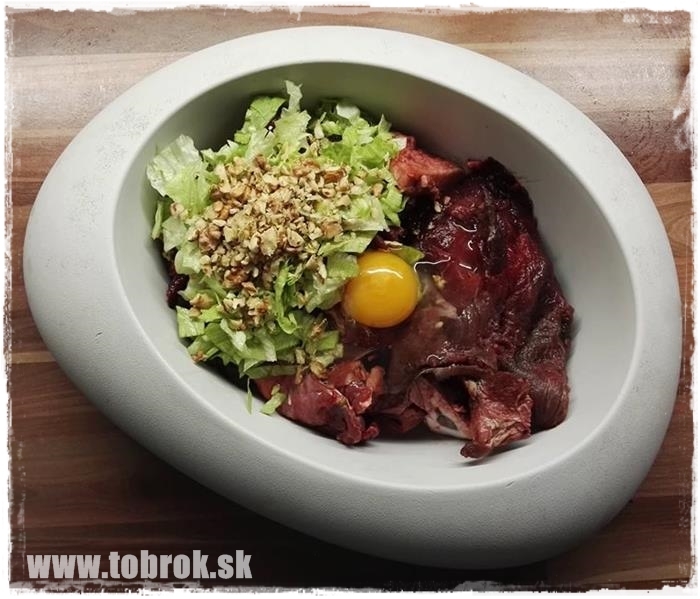 1 Pork, curly salad, tuna in oil, buckwheat. Fig. 2 pork and beef, grated cucumber, egg, spare flakes. The two dishes were bones for dinner because of the calcium. Fig. 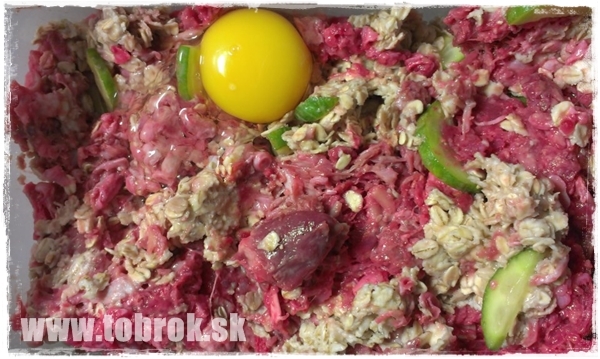 1 ground beef, spare flakes, cucumber, egg, heart, quality oil. Fig. 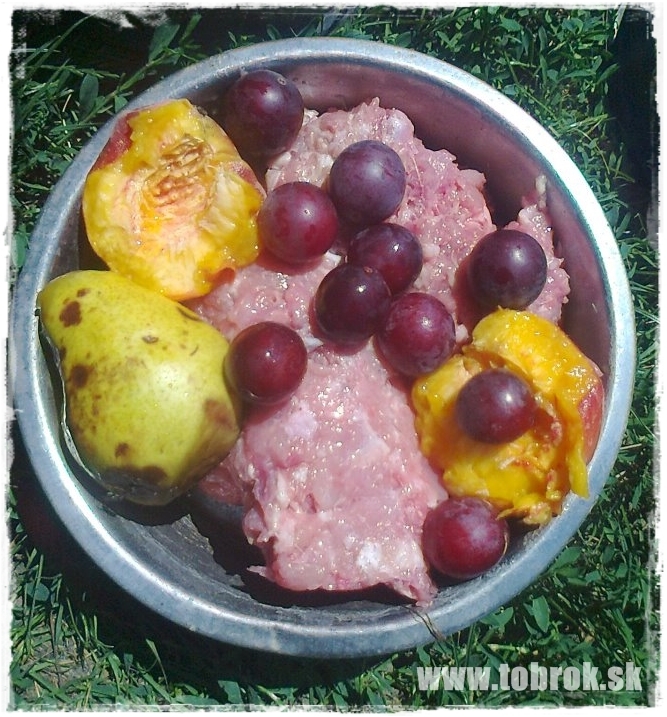 2 seasonal fruits in the summer as a source of vitamins, ground meat - pear, peach, plums). Fig. 1 Ground beef, oat flakes, raw whole eggs, oil, carrot and parsley, cheese, chicken hull, sliced beef heart and a whole one. Fig.1 Ground meat with oat flakes, chicken pieces and lettuce, chicken skeleton with inneries, oil. Figure 2 Beef with bones, ground meat, oat flakes, apple.